PAUL JAY, SENIOR EDITOR, TRNN: Welcome back to The Real News Network. We’re in Beirut with Professor Fawwaz Traboulsi. He’s a political activist and associate professor of political science and history at the Lebanese American University in Beirut and the American University in Beirut, and author of A History of Modern Lebanon. So we’re now in 1990, a decade more of struggle between Hezbollah and Israel. So take us through that. FAWWAZ TRABOULSI, PROFESSOR OF POLITICAL SCIENCE AND HISTORY, LAU: That decade is also rich in other events, which is the application of that new system, that new political system. JAY: Meaning that division ofï¿½. JAY: A president, a prime minister, and a speaker of the house, but with all kind of presidential powers. JAY: President Assad of Syria. TRABOULSI: ï¿½of Syriaï¿½of those conflicts between the three very uneasy representative of the three main major sects. JAY: And is the Syrian army back in Beirut during this period? JAY: A family that controls some of the major banks. TRABOULSI: ï¿½one major bank, but more importantly an ally of the Saudi family, actually, a partner in Saudi Arabia of, at that time, Prince Fahd, who will become King Fahdï¿½now is assigned as prime minister, but with the role of what is called reconstruction. Okay? 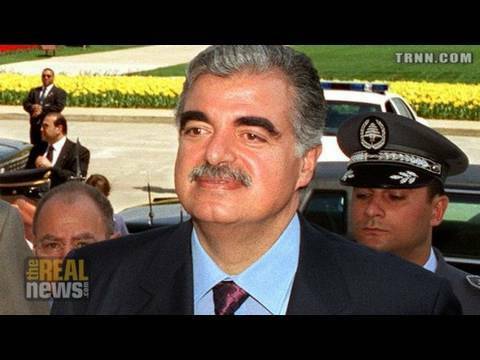 So it’s economic, in the hands of Rafic Hariri, fighting against Israel/Hezbollah. This is the main division of power. JAY: While the people of Lebanon on the whole are very poor, there’s still a lot of money flowing through Beirut. TRABOULSI: Now a lot of money flows. A lot of money flows. Many immigrants come back because of the high rates of the interest for government bonds. You have three or four years of massive inflow of placement in government bonds, Arab and international. And most of the investments are either in government bonds or in real estate, which is where you have the highest profits, and, as you know, capital follows always. JAY: And what happens in the drug trade? TRABOULSI: The drug trade is progressively under control, and abolished by agreement between the US administration and Syria, which was catastrophic in that sense, because by the time war ended, you have some 80,000 families living off drug production, rather than follow the traditional method any country follows, which is we abolish sections of the drug production in return for help, for financial aid. The Syrian government, with the American government, decided to simply launch one major campaign and abolish all drug production. So we had a huge problem which led to a split inside Hezbollah, because the ex-secretary general of Hezbollah led a rebellion of the disinherited from the drug trade, who are actually poor farmers who would make $3,000-$4,000 a year from producing their own hashish, which is taken over, where the billions are made in the later phases of the trade itself. JAY: Yeah, when the drug hits North America. TRABOULSI: You have an abrupt end of the drug production and severe, severe problems in the northern part of the Beqaa. JAY: The other feature of much of this period which we haven’t talked about is emigration. Talk a bit about the effect of that. TRABOULSI: One thing one should know is that the war led to some 800,000 Lebanese emigrating. Now, many, many would come back, but there is something in Lebanon which we call deep emigrationï¿½many who have gone to Canada, Australia, and New Zealand, the United States, were the ones who usually did not come back. But you have, in addition to emigration, Lebanese working abroad. The African emigration is closer with the European. Many of European emigration would come back. But very importantly is the immigration to work in the Arab Gulf and in Saudi Arabia. Now, physically, 40 percent of Lebanese working force is employed outside. So you have after the war a real rentier economy in Lebanon, where most of theï¿½when Lebanon simply exports human beings and imports almost everything, with marginalization, progressive marginalization of agriculture and industry and an exaggeration of the scope and capacity of the services sector, especially the money sector, ’cause, as I said, the banks are helped to recapitalize by the conscious decision of the cabinets of Prime Minister Hariri to borrow money from Lebanese banks at very high interest rates. So this has helped them assume the power that they now have over the whole economy. JAY: And where is the government getting its revenues? They’re taxing the money the Lebanese workers are sending back? TRABOULSI: As you could imagine, the Lebanese balance of trade is in a huge deficit. It’s a ratio of one to ten, one for exports, ten for imports. Now, the difference is usually the result of the remittances of the emigrants, where you end up with a limping balance of payments. But this is how money is leaving the country, and this is how the debt is accumulating. So it’s not only a budget definite [sic]; it’s a national debt, aggravated by very ambitious reconstruction plans by Mr. Hariri, who had imagined that there is going to be real Middle East peace and that Lebanon would have an international trade center for the whole region. Of course, you had tens of billions of pounds invested, or simply stolen, in that huge enterprise which was called reconstruction. JAY: Even at 49 percent on government bonds, there has to be some idea there’s government revenues. So what are the revenues? Are they taxing the remittances? TRABOULSI: Customs duties was one of the major sources of income for the government. And once Prime Minister Hariri decides that we join the WTO, those are reduced also, drastically. Government sources are mainly indirect taxes. We have a very strange taxing system. Under the pretext of encouraging foreign investment, income tax was lowered from 15 [inaudible] income tax return income. But the majority of the tax income comes from indirect taxation in Lebanon. We don’t, of course, have any progressive income tax. JAY: Is this a value added tax? TRABOULSI: The value added tax was created in the later period, after 2000, after 2000. But no, by indirect taxes I mean taxes on fuel, taxes on cigarettes, taxes on bread, taxes on telephone communications. Economic exports have proven how the taxing system simply takes some $20 million from the poorer sections of the population, gives them to the largest sections, the richest sections. JAY: It’s a way of capturing the remittance income: people send money back to their families; the families buy things; it gets taxed; the government take the money and pays it to the banks. TRABOULSI: A lot of the money is simply swept from the market through high-consumption habits that have developed, especially under the influence of [inaudible] people working in the Gulf and taking the habits of conspicuous consumption. JAY: Okay. In the next segment of the interview we’ll jump to 2000 and the withdrawal of the Israeli forces. So please join us for the next segment of our interview with Fawwaz Traboulsi.